Looking at our Chicago trade show planning calendar, the months ahead look quite busy with shows like #ASCO and #NRAShow coming to the city. Chicago is no stranger to trade shows and events, and it has also seen many changes in recent years when it comes to working conditions and exhibitor rights. Many of the changes benefit the exhibitor, but talk about confusing! Our Chicago trade show and event labor operations team is constantly fielding questions about exhibitor rules and union regulations. To that end, we created a simple guide. Get it by clicking on the below, study it, and never again be afraid to hand-carry that box into McCormick Place. 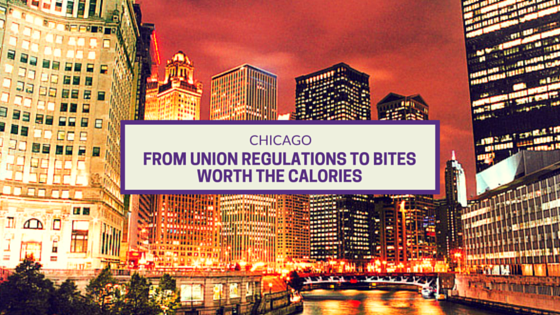 Of course, if you need a Union Regulations translator, you can always reach out to our Chicago team here too. And because I personally like a snack while I read, we also wanted to give you the 411 on Chicago’s best bites that are field-proven to be worth the calories. Plus, with all those miles you’ll be logging on your Fitbit to and from the event venue, you have nothing to worry about. Mangia!